Termites in Jasper, Georgia and surrounding areas are similar to most other areas in the southern United States. They can remain undetected for long periods of time. This allows them to do serious damage without being discovered. Termite swarms are often the first visible indication that termites are present. Termites swarm most often during the springtime, typically between February and April. These swarmer termites, however, are often confused with flying or swarmer ants. Because ants are often seen swarming around buildings, it is important to distinguish between the two so that appropriate control measures can be made. Swarmer termites are the caste most often seen by homeowners. They have fully developed wings and eyes and are usually much darker than the other members of the colony. All four wings are the same length and are longer than the length of the body, stretching beyond the tip of the abdomen. Flying ants will have a very thin, defined waist with two pairs of wings of unequal length. Ants also have elbowed antenna. The chart below will help in identifying if you have flying ants or swarming termites in your home. Termites swarm most often during the spring time, typically between February and April. These swarmer termites, however, are often confused with flying or swarmer ants. Because ants are often seen swarming around buildings, it is important to distinguish between the two so that appropriate control measures can be made. 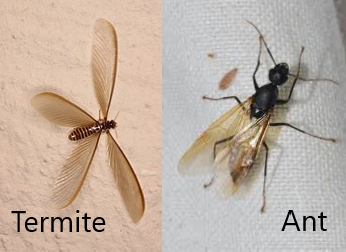 Notice the physical differences between a swarmer termite and a flying ant. If you suspect that you have a termite or ant swarm in your home or on your property, you should call your pest management professional right away and ask them to come take a look. If you do have a termite infestation, you want to get rid of them as soon as possible in order to prevent serious damage to your home. If you think you have a problem with termites or ants. . . or any other pest . . . or simply have a question. . . call Faith Pest Control at 770-823-9202. We’ll be happy to speak with you any time. P.S. And be sure to ask about our FREE 58 Point Pest Analysis of your home or office.